A plastic bag with a picture of Huan Huan, one of the cartoon mascots of the Games, on the outside. And inside: a live goldfish. The bag is part of a plastic key ring. According to the Telegraph story, the bags are sealed, so the fish live in a small pool of water, with little access to air, and no food whatsoever. The goldfish key rings are, of course, not a piece of official Olympic merchandise. The story quotes a spokesperson from the United Kingdom’s Royal Society for the Prevention of Cruelty to Animals calling the key chains a gimmick which “show no respect for the animals at all,” though there’s no record of the story on the RSPCA’s web site. A manufacturer of the key chains could not be identified. 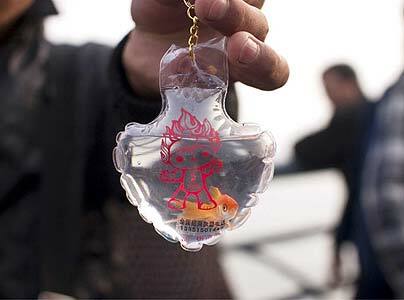 This could mean the entire thing is a hoax, although there is a picture here of something that looks like a live goldfish in a tiny plastic bag. This is not the first “animal cruelty” situation linked to China. Another British media organization, 24-hour TV news channel Sky News, reports small restaurants serving dog meat will be shuttered during the Olympics, to avoid offending visitors from the U.S. and Europe. Giant Aquarium! The Animal Video Of The Day!! !